Oriolus larvatus Lichtenstein, 1823, "Terr. Caffror" = Cape Province, South Africa. 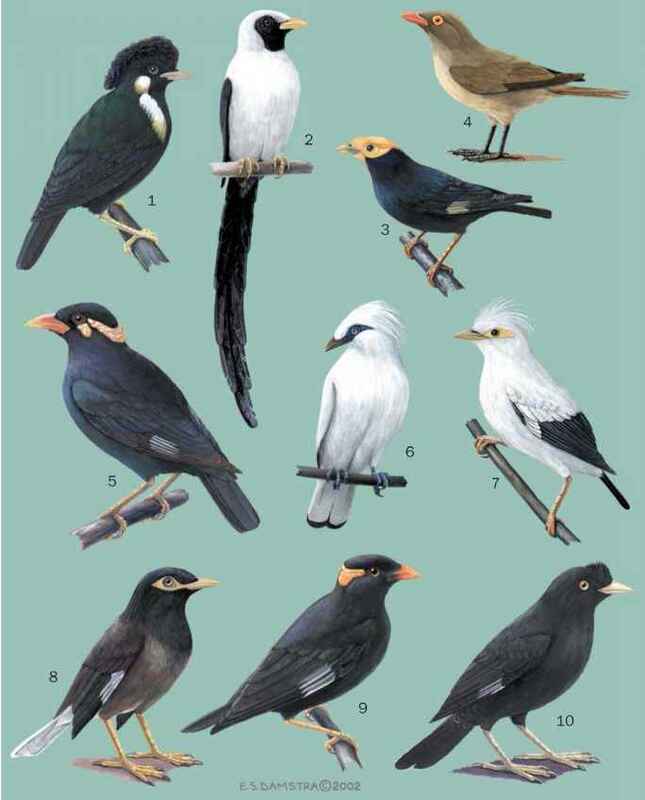 Five or six regional subspecies differing in size and tone of golden plumage. English: Black-headed oriole, African black-headed oriole; French: Loriot à tête noire oriental; German: Maskenpirol; Spanish: Oropéndola de Cabeza Negra Africana. 8-8.5 in (20-21.5 cm); 2.2-2.5 oz (60-70 gm). Sexes similar. A black-headed oriole with citrine back, golden ventrum, and gray-green wings and tail; only immatures duller and streaked ventrally. Central and southeastern Africa, north to Sudan and southwest Ethiopia, south to Cape Province, and west through much of Angola locally to west coast. 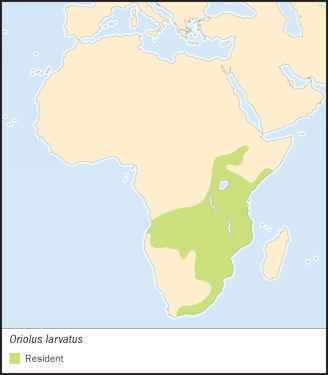 Acacia and broad-leaved woodlands, especially in galleries along streams; also thorn scrub, forest edge, tree plantations, and gardens. Solitary and rather sedentary, in pairs or small family groups only when breeding or at food concentrations. Calls in considerable variety from tree perches throughout year, mimicking and giving both fluted glottal warbles and figbird-like whistles. Forages mainly in tree crowns, hopping and fluttering, for fruits and caterpillars. Food comprises both small, soft native fruits such as figs, grapes, and mulberries, and insects, particularly large haired and hairless caterpillars, all taken opportunistically. Monogamous and territorial, pairs holding territories of 12-120 acres (5-50 ha). Breeds erratically year-round in tropics, but limited to spring and summer in temperate southern latitudes. Female builds nest and broods, and male holds territory and assists in rearing young. Nests slung in a three-way fork in horizontal branches at 15-50 ft (5-15 m) above the ground. Eggs in clutches of one to two in tropics and two to three in temperate zone, hatch in 14-15 days; young fledge in another 15-18. No forms of this common and widespread species are under threat.